This last weekend I spent a few hours up on Baildon Moor, all on the North side of Bingley Road other than a few minutes with an ice cream at Shipley Glen. On Saturday I was up there reasonably early, about 6:30, to have the light behind me so that I could get well lit photos of diving Snipe. Unfortunately the Snipe didn’t get my invite. I WILL get a photo that is recognisable. My walks took me around and about quite a bit but instead of the photos following the route I’ll do them in something like size order. The smallest being the butterflies. but this Peacock did. 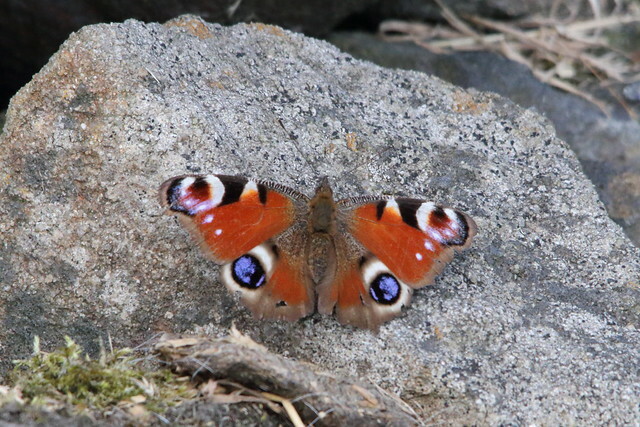 Parts of its wings and body are a similar colour and texture to the rock it is on so it looks very diaphanous. 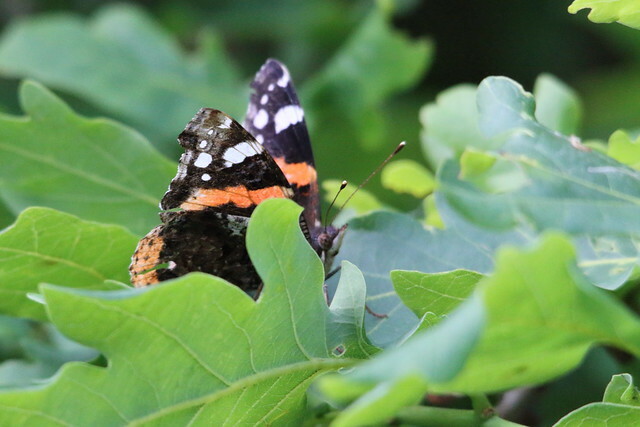 This Red Admiral was hiding up in the trees and keeping its beady eye on me as I took its photo. 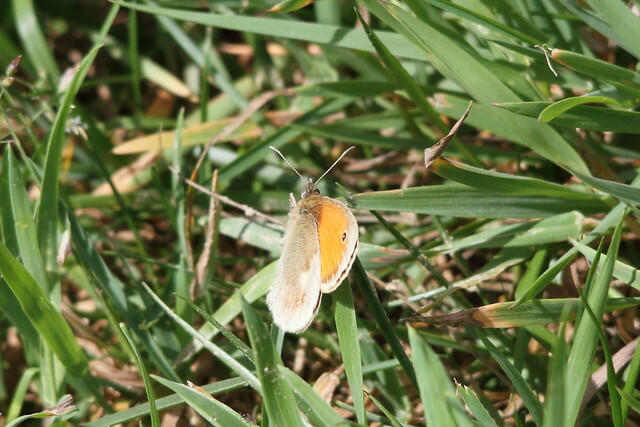 This Wall butterfly settled on the grass long enough for me to capture it. But a 150-500mm zoom lens is not the best to use for this kind of subject. Admittedly I have yet to try my extension tubes on that lens. We then move up in size to an adult Willow Warbler. 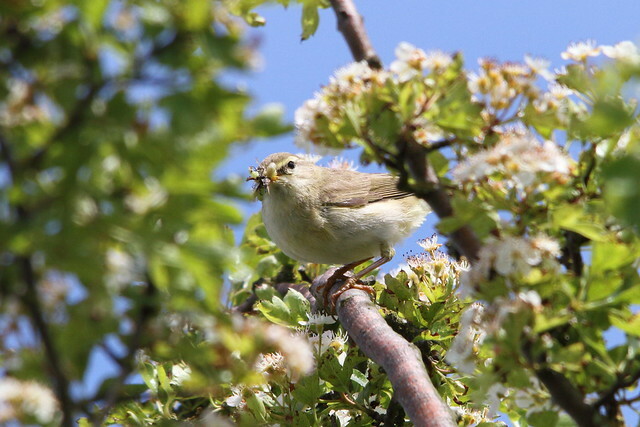 If you follow any of these photos to Flickr you can see some other shots of Willow Warblers. 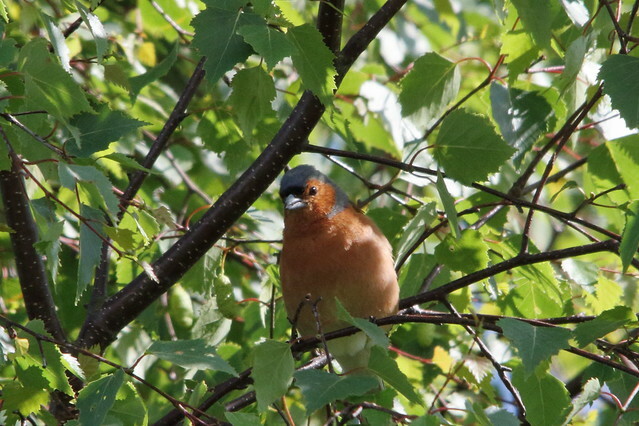 This Chaffinch is looking as though it is waiting to be fed by the Willow Warbler. 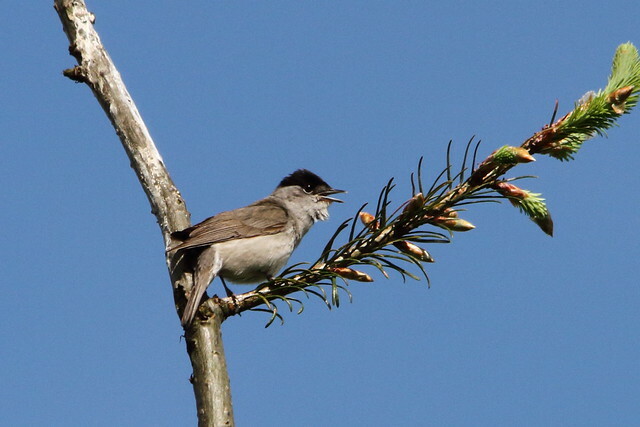 And here we have a singing Blackcap. It is a very monochrome bird. I have not played about with the colour in the photo. 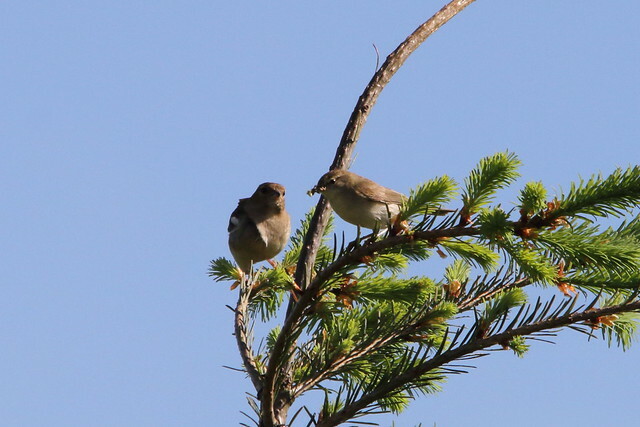 I wonder if this is an adult Chaffinch that is supposed to be feeding the one that was looking longingly at the insects in the Willow Warbler’s beak? 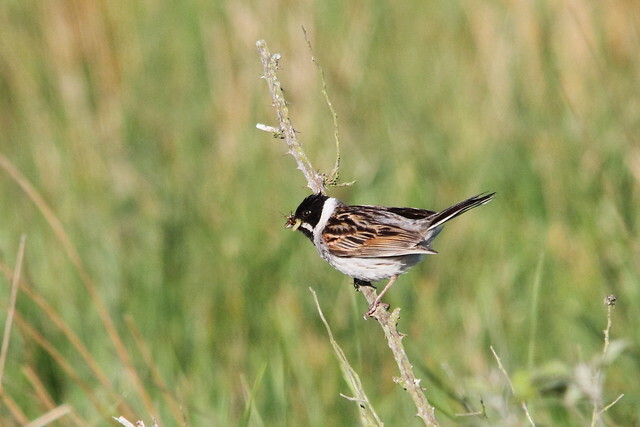 Now we have a Reed Bunting with a few tasty morsels for its young. This is on the moors. 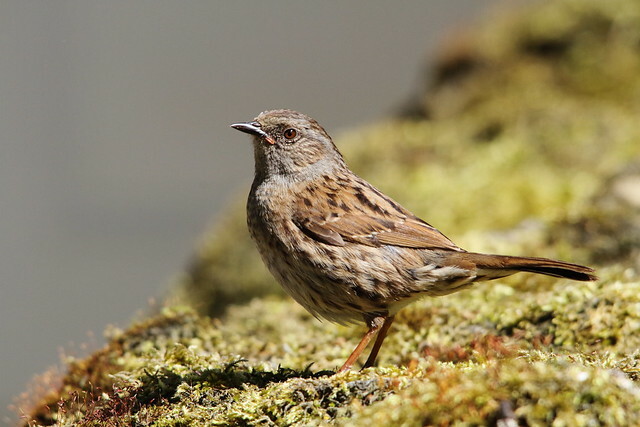 This is quite a nice close up of a Dunnock at Faweather. Dunnocks can be common garden visitors and so let me get a bit closer than all the others have. I think its the only photo you could say is in focus. One of the rarer birds I heard just along the way from this Dunnock was, I like to think, a Grasshopper Warbler. As expected I didn’t get a glimpse of it but its sound was grass hopper like, but longer. But then it wasn’t as long as I thought a Grasshopper Warbler normally kept going. Could it have been another Dunnock, a Wren or young in a nest? But I did think I saw a little shape flip over the wall the other side of the bushes. 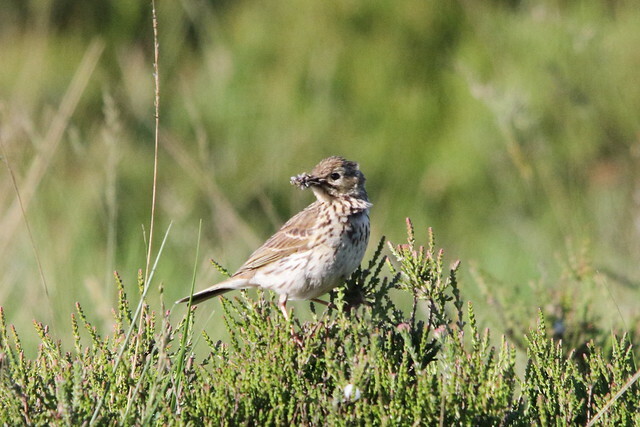 Here’s a Meadow Pipit with food for its young. Please note I will be happy for someone to tell me I have got it wrong and that this is a Skylark. 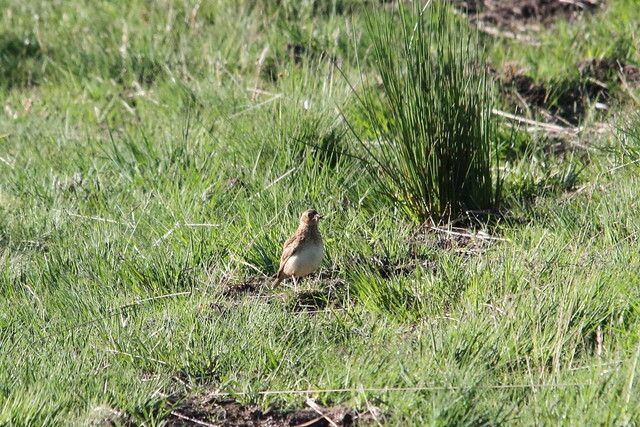 But I think that this one is a Skylark. Again a bird with food for its young. 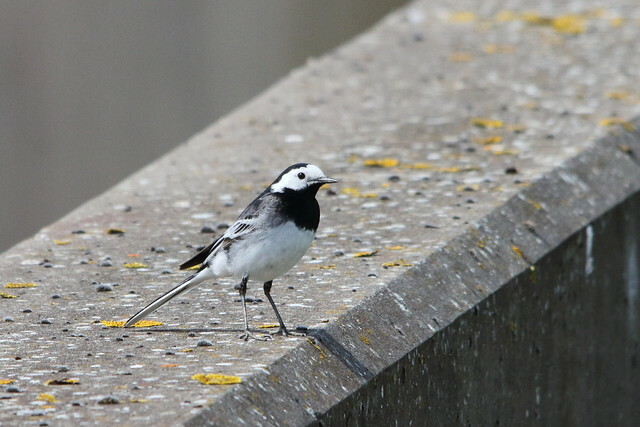 If you are that way inclined you can let me know that this Pied Wagtail is smaller than the Skylark and so should have come before it in the list but I am happy for it to be here. 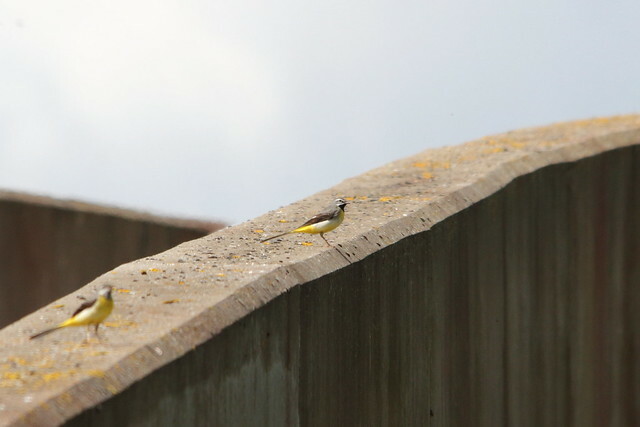 Along with these two Grey Wagtail on the same strip of concrete. No food in the beaks of any of these Wagtails. 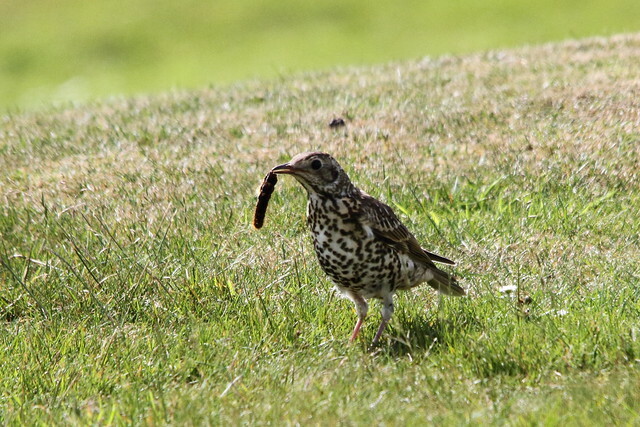 Now we are back to the moor again, on the golf course, for this Mistle Thrush. It was giving this caterpillar (?) a right bashing. I don’t know if it was preparing to eat it itself but it flew off with it. Again, perhaps some young are around for it to feed. 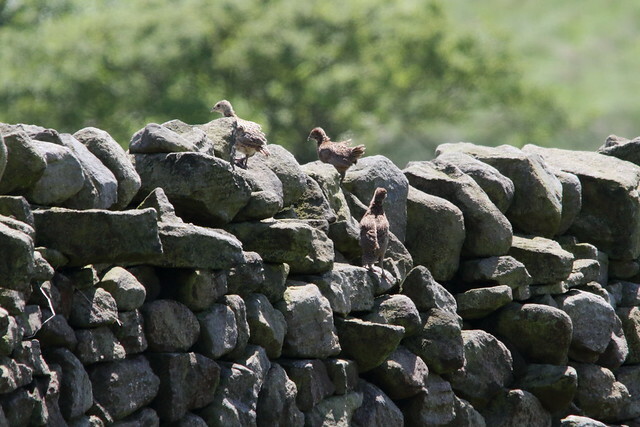 These three young Grouse looked as though they were off on an adventure. They got to the top of the wall in a couple of stages and then after having a look around jumped off into the big field beyond. 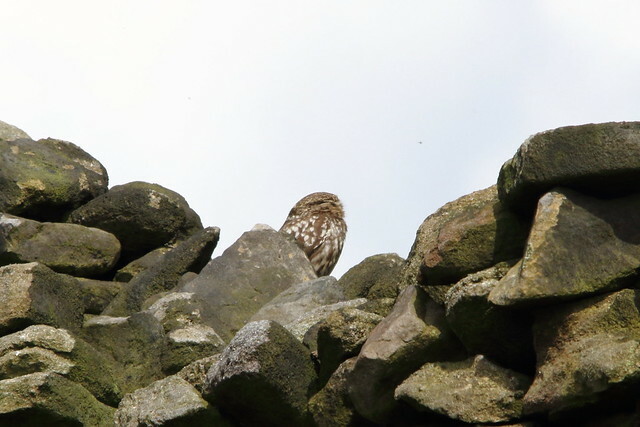 This Little Owl was also looking into the field beyond, in this case a different field but it spotted me as soon as I got beyond the end of the wall to its side. And off it flew. 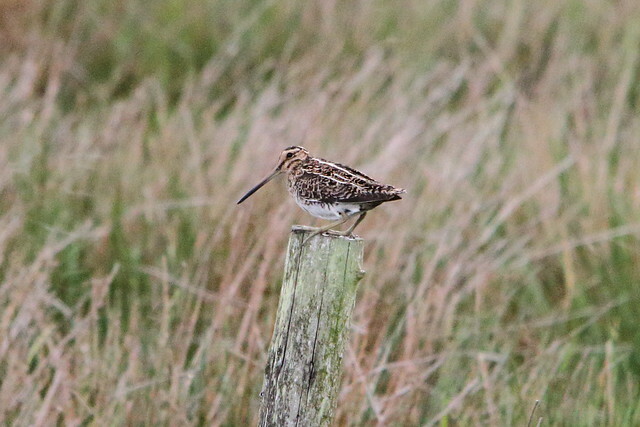 Though I went up early on Saturday morning for Snipe I didn’t get this photo until quarter to two on Sunday afternoon. 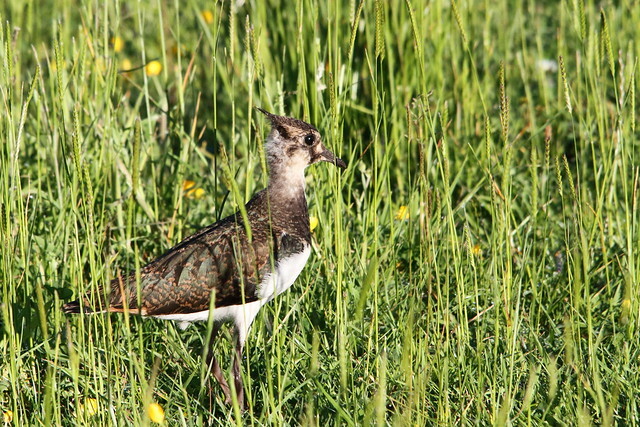 The Lapwing chicks are growing well. 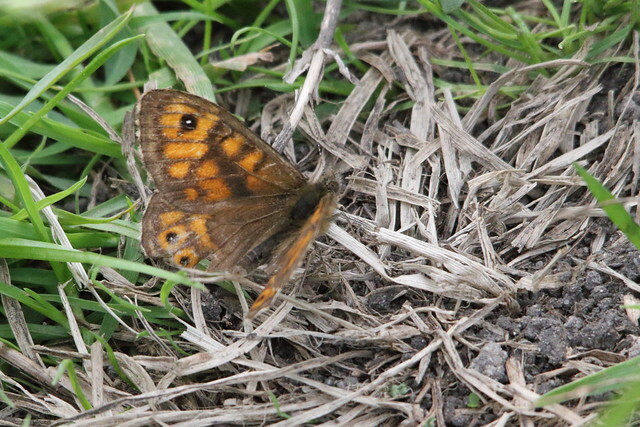 This one was over in the corner near the cattle grid, near where the warning sign is. It’s amazing how they manage to survive and not be trampled on by sheep or cattle or picked off by Crows, Jackdaw, Stoat or Red Kite. I don’t know how often they venture on to the road, I can’t say I have ever seen one on the road, but I guess it happens or the sign wouldn’t be up. The adults are very protective. When you see relays of adults dive bomb any threat you can perhaps see them surviving. 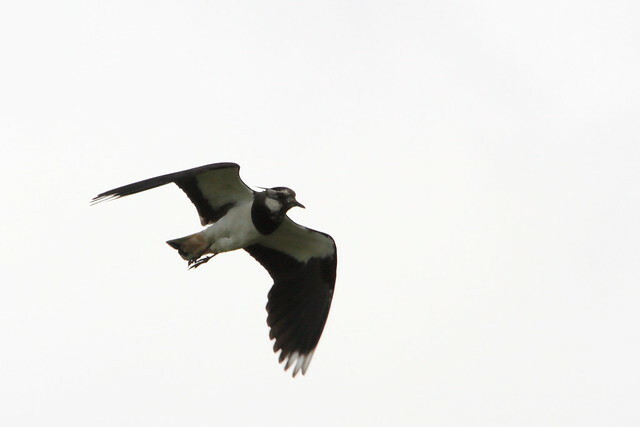 I have a few blurry photos of a gang of Lapwing taking it in turns to see of a Red kite.I think this adult Lapwing is asking me to leave. 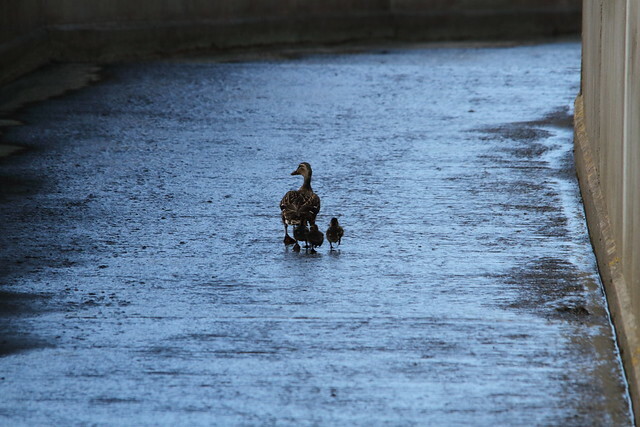 Here’s mum Mallard duck walking up the channel with three ducklings in tow. No doubt looking for somewhere with a few more tasty insects or berries or plants to nibble on. 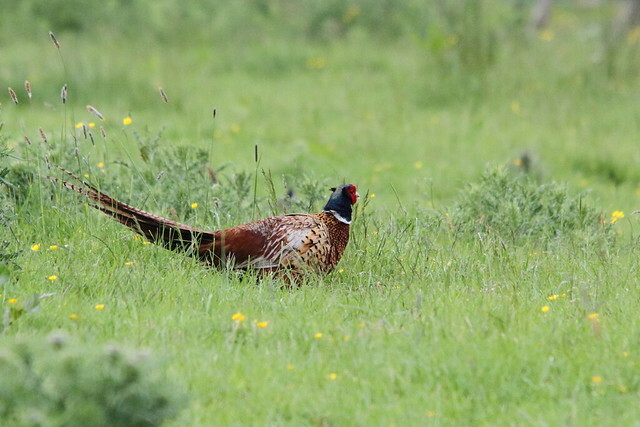 This is possibly the heaviest of the birds for this weekend, a male Pheasant with a lovely set of tail feathers. 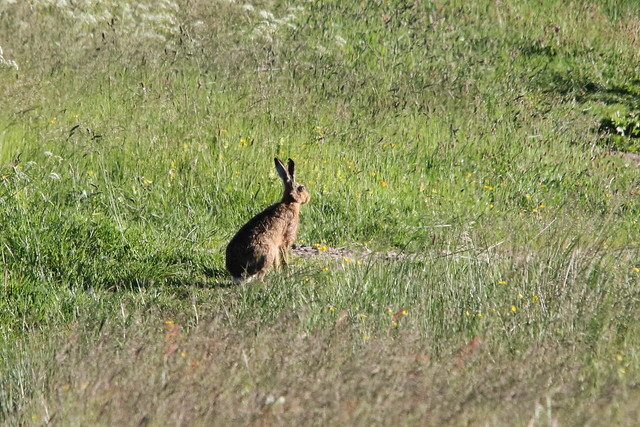 This Rabbit obligingly stuck its head up and had a look around while I was close enough to see it. 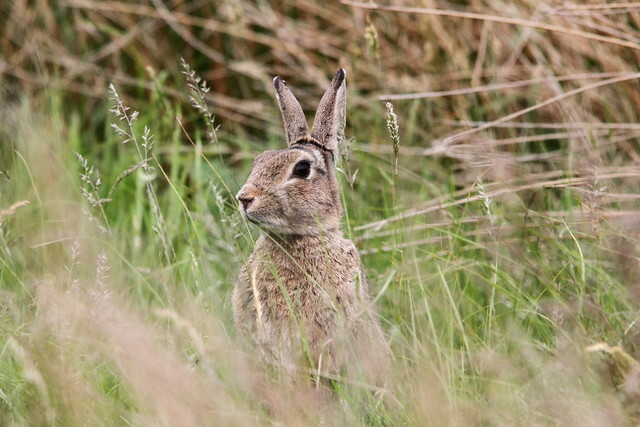 And this Hare had a little look around before scampering off into the longer grass. 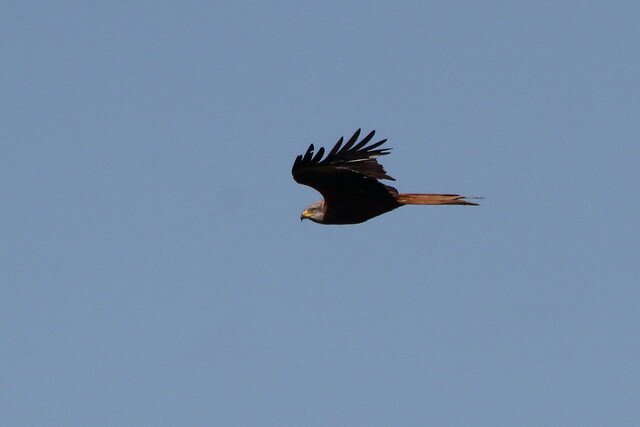 This Red Kite might have the longest wing span of the weekend’s birds but I don’t think they are very heavy. Things I have been reading about them say that they are not strong and that their legs/talons are quite weak – they can only manage to carry away small Rabbits. 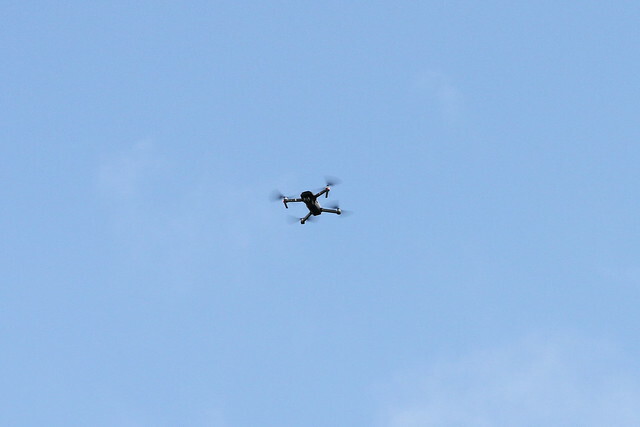 This went up into the air when I stopped at Shipley Glen for an ice cream. It was a little surprising given that the place was very busy – but then who reads the small print in the instruction manual? It looked like an intelligent one, one of those that stays where you put it and lands itself safely when you tell it to. Baildon Moor is a registered urban common with rights of access by the public for “air and exercise”. 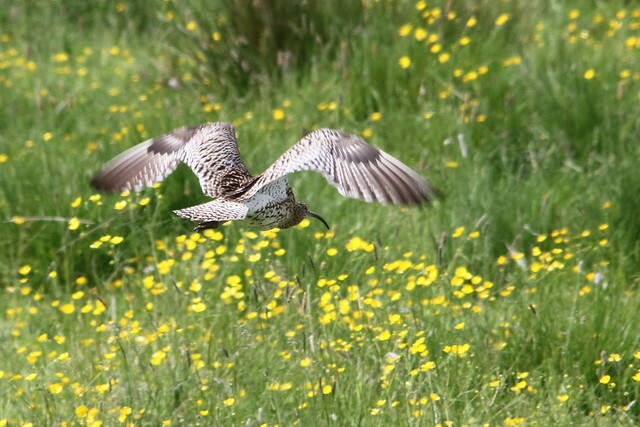 It is quite small but is one of the most heavily used areas of upland moorland in the country. 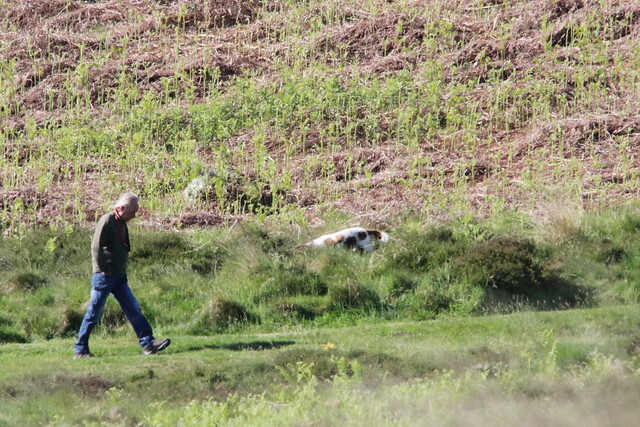 Dog walking is a common activity. 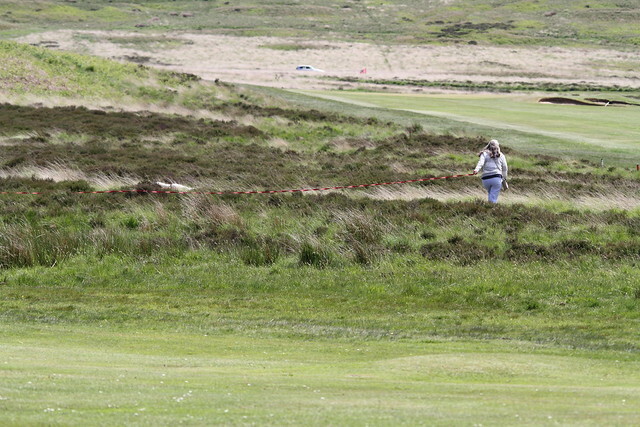 This dog is on a lead – the red ribbon going out of shot on the left and then back to the dog that you can see the back of just to the right of that darker clump of heather that the tether goes through. I don’t think I’ve seen a “lead” that long before. 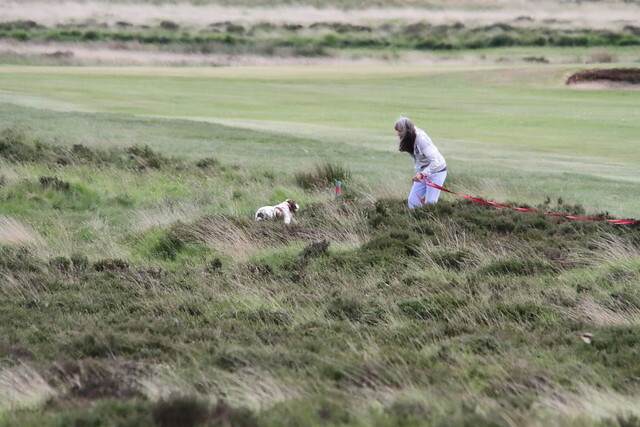 I wonder if this is the dog returning after it has found something – a golf ball perhaps. 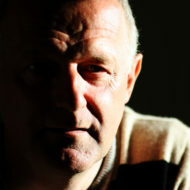 There is a group called Friends of Baildon Moor? Have a look at their website. Keep an eye out for events they organise – join them on Facebook. The Friends help Bradford Council manage the Moors, including Shipley Glen. They organise Litter Picks and path clearing and try to keep an eye on things so fallen trees or other damage can be sorted quickly. 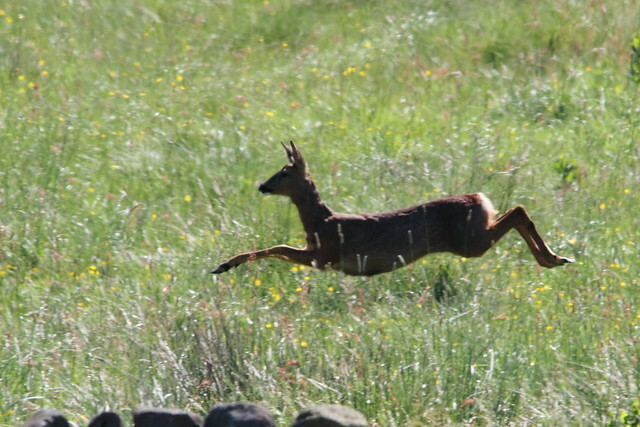 With their help Baildon Moor will continue to be a fantastic resource for us and wildlife like this Deer. I love reading your blogs. Really interesting. Nice read, that, thank you. Great photos, too.